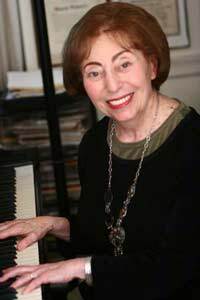 Blanche Abram, pianist and co-director of the American Chamber Ensemble, has performed throughout the eastern United States and the Caribbean and on TV and radio stations WQXR, WNYC, WFUV and News 12 Long Island. She is Adjunct Senior Professor of Music at Hofstra University and was a long-time faculty member of the 92nd St. Y. Professor Abram has lectured extensively in the United States and abroad, including a presentation at the International Conference on Tension in Performance in England and is well known for her many workshops and Master Classes. With her colleagues of the American Chamber Ensemble, she has given numerous premieres and recorded the works of Hindemith, Zaimont, Weigl, Tepper, Deutsch, Richardson, and, with Naomi and Stanley Drucker, the compositions of Richter, Siegmeister and Kupferman. She is represented on the Leonarda, 4Tay, Gasparo, Soundspells and Dionysian labels, with an upcoming release on Elysium Records. Honored by the Music Teachers National Association as a "Master Teacher", she received the 1998 Pathfinder Award for Excellence in the Arts from the Township of Hempstead in recognition of her work as both a performing artists and an arts advocate. Professor Abram is the author of numerous articles that have been published in Clavier magazine, Piano and Keyboard and Long Island Parenting, among others. Her work as a pianist is referred to in Clarinet Virtuosi of Today and American Keyboard Artists and a section of Beloved Tyranna, Joseph Rezits' book on Isabelle Vengerova is devoted to Blanche Abram. Naomi Drucker, clarinetist, co-director of the American Chamber Ensemble, has performed, recorded and toured with the New York Philharmonic. She has performed in Japan, Great Britain, Russia, Sweden, France, Canada and Argentina, and has appeared as soloist with the Nassau Symphony Orchestra, New York Virtuosi, Philharmonia Virtuosi, Massapequa Symphony, Long Island Baroque Ensemble. Long Island Symphony and West Islip Orchestra. 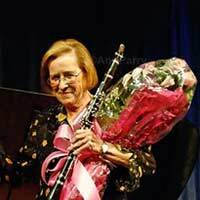 She has given performances at the International Clarinet Convention in Paris, Toronto, Pittsburgh and Washington , DC. With her husband Stanley Drucker, principal clarinetist of the New York Philharmonic, she has performed on a tour of eleven cities in Japan, at the East Meets West Music Festival in Sweden, in 1996 at the International Clarinet Congress in Paris, in Singapore, at the Music Conservatorium in Sydney, Australia and at the Mykonos International Chamber Music Festival. Principal clarinetist of the New York Virtuosi, she began her career at age 21 as principal clarinetist of the North Carolina Symphony. A graduate of Hofstra University and an Adjunct Professor of Music at her alma mater, she received the 1994 George M. Estabrook Distinguished Alumni Award for career achievement. With the American Chamber Ensemble, she has recorded music of Zaimont, Hindemith and Weigl and has performed on New York Legends - Stanley Drucker for Cala Records and Naomi Drucker and Stanley Drucker Play Meyer Kupferman for Soundspells Records. A 1998 release, Music for Doubles, on Elysium Records, features Naomi and Stanley Drucker performing the Krommer Concerto, Op. 35, for Two Clarinets and Orchestra, Peter Tiboris conducting. Ms. Drucker enjoys a busy teaching schedule and is a strong supporter of her many friends who are Long Island composers.